The colored gemstone industry plays a tiny role on the world economic stage, but it has long been an important livelihood for hundreds of thousands of miners and traders in developing countries. Improving those miners’ returns on their labor and their working conditions has been a difficult challenge, given the fragmented nature of the industry and the myriad conflicting interests at each trading level. The Organization for Economic Cooperation and Development (OECD) held an important first-of-its-kind forum involving gemstone mining at its Paris headquarters in May to bring together as many actors in this scattered industry as possible. The goal of the three-day conference, that included a session on gemstone mining, was to begin the process of creating policies for sustainable mining practices and increasing returns for miners who often dig by hand with little to show for their efforts. The OECD consists of 34 developed democracies with market economies that work with each other and some 70 non-member countries to promote economic growth and sustainable development. The organization estimates that 100 million people in more than 70 countries are engaged in artisanal and small-scale mining of a variety of minerals. About 15 million are mining for gold, including 4.5 million women and 600,000 children. The forum, which included representatives of gold and other mineral interests in addition to colored stones, provided a platform for source country governments, gemstone traders, miners, civil society groups, large retailers and responsible source-certifying organizations to begin hammering out policies that will benefit producing nations and miners, while balancing the interests of other players. Governments want revenue from and control of their resources, while miners resist regulations and export duties. Artisanal miners – those digging with hand tools – often get very little from their finds partly because many of them operate illegally on private property or government-owned land and because they are often the poorest, most marginalized elements of society without education or power. Large mining companies and fair trade certification agencies can adopt policies to promote sustainable mining and labor practices, and can afford the certification process. Small miners and dealers complain that such certification measures are too costly and are often used as an excuse to muscle them out. Civil society groups and non-governmental organizations (NGOs) working with resources such as gemstones often insist on near airtight accountability for every gemstone mined, while miners and dealers claim this is an unrealistic, if not impossible, goal. Retailers increasingly want supply chain accountability to counter customer concerns – real or potential – over sustainability and conflict issues. Miners and dealers in source countries, however, are often unaware of such consumer concerns or have different or conflicting priorities. The OECD is working to balance all of these conflicting interests into its guidelines. The majority of attention to the artisanal mining sector focuses on bringing miners into the formal sector, which means legalizing their activities to help reduce their dependence on money launderers and corrupt officials who often extort money or other benefits from them in exchange for allowing them to continue mining illegally, said Estelle Levin-Nally, a consultant on mineral artisanal mining sustainability and previously director of the GIFF project. Levin-Nally said governments are starting to come around on this issue. She added, however, that the “colored gemstone industry has, by and large, accepted the relevance of OECD guidance for responsible sourcing of minerals to their sector.” She said that this is a new development, adding that there are still large gaps to work through. She acknowledged that realities at the mine sources “can be quite messy with crime, smuggling and control by corrupt elements. These are problems that still must be dealt with in many situations.” She emphasized the importance of commercial pragmatism and taking a “human rights based approach” to unleashing the economic potential of the sector. Governmental representatives at the meeting stressed the need to gain control over the mining of their resources before sustainable mining and fair labor practices could begin to operate. This means controlling mining and access to gem deposits; developing workable export procedures that bring in revenue, but do not invite smuggling; and excluding smugglers and criminal elements from mining areas. 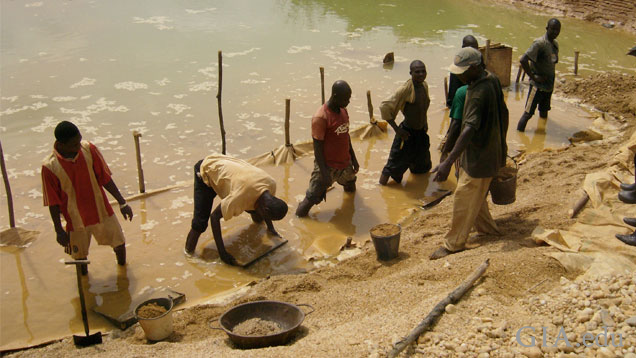 While Levin-Nally notes that governments have been taking more initiatives in this direction, Jean Claude Michelou, a gemstone trader who has worked on these issues with the International Colored Stone Association, said the situation of many “informal” miners – those mining without permission from the government – remains very difficult. “Many of these miners have no other means of support, so we need to find a way to legalize them,” he explained, adding that a number of countries continue to regard them as illegal squatters and operators. 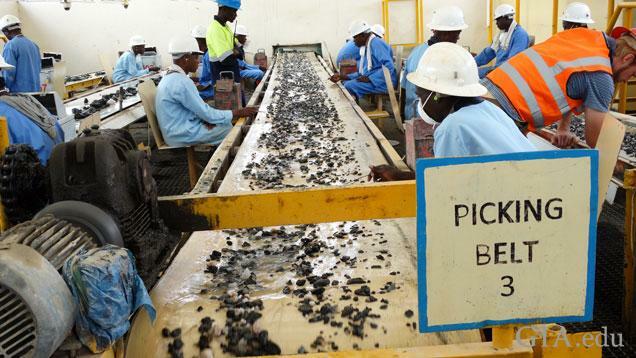 Michelou, said some governments are now working to bring these miners into their legal framework. “Colombia is one of the more involved governments in both its emerald and gold mining industries,” he said, because the government came to understand how much revenue it was losing by keeping these miners outside the system. Myanmar, long an outlier because of sanctions against its military government, is also moving to wrest control of its ruby and jade production, Michelou said, adding that estimates of lost revenue shocked the country’s representatives at the meeting. Myanmar’s jade production is beset by huge challenges, noted in an earlier report. While the OECD has developed an operational framework to account for all parties’ interests, the World Bank is starting to fund specific efforts to put these policies into practice through its Sustainable Management of Mineral Resources project. Jeff Bilgore, who attended the meeting on behalf of the American Gem Trade Association, said his organization has developed a code of ethics and due diligence procedures over the past three years and its aim is to get these standards adopted by the OECD. ethical sourcing and production of colored stones, and learn what some industry leaders are doing to address the situation. The Responsible Jewellery Council held a discussion on the challenges, issues of certifying colored gem firms at the 2017 Baselworld fair. The diamond, colored stone, and pearl businesses have witnessed unprecedented change since the turn of the 21st century. The past decade saw some impressive discoveries of diamonds and colored stones.